The best tactical shotgun sling helps you to easily carry your shotgun around. Shotguns are used in the U.S. by both the police and individuals licensed to carry firearms. The tactical shotgun sling is an added accessory that helps you strap the gun to your side while moving. In addition, it acts as a safety feature that prevents people from taking the shotgun away from you. A tactical shotgun sling is easy to mount if it is compatible with your gun. The simplest shotguns to strap are those that come with sling mounts. However, you can get mounting accessories from a gun shop if your shotgun does not have a sling mount. Shotgun slings also differ in how they are attached to the double barrel gun. Some can be strapped while others require the sling to be screwed into the gun. To mount a tactical shotgun sling onto your rifle, first locate the mounting hole in the stock. The shotgun sling should have a latch that fastens onto the mounting hole. Tighten the latch by screwing it in a clockwise direction. The other end of the sling attaches to a threaded screw hole on the fore-end or handgrip. If your shotgun does not have this feature, you may have to buy a mounting attachment and slide it down the barrel to fit. Safely position the gun around the middle part of the barrel. You should have a second screw that secures the latch onto the fore-end handgrip. Once this is done, you have successfully attached the tactical shotgun sling to your rifle. There are three types of shotgun slings: the carry strap, shooting slings, and the patrol slings. This type of shotgun sling is readily available and the cheapest to buy. It attaches to the front and rear of the rifle and has a special padding for comfort when hoisting the rifle onto your shoulder. As the name suggests, these rifle straps are designed solely for carrying the gun. However, they are not built from high-quality material and are suitable for the rifle owner who occasionally carries the gun. Carry strap slings are not ideal to be used as shooting aids; nevertheless, they can still offer some level of stability. One end of the sling is detached and wrapped around the fore-end handgrip. This is called the “hasty sling”, a technique commonly used by professional gun handlers. These function as carrying straps, but with the added benefit of aiding the gun owner to aim. They are divided into two categories: the detached loop and the integrated loop shooting slings. The detached loop slings are designed to be used in rifles with strong sling mounts like the M16 assault gun. The part fastened on the gunstock is detached then anchored to the fore-end arm support to create a loop. With enough sling tension and the rifle properly positioned, this loop offers the same stability as a bipod. The integrated loop sling also creates a loop for support, but neither end of the sling needs to be detached from the gun. The sling is long enough to double back at the front swivel and re-attach on the stock. This forms a wide loop that provides the required stability. These loops are constructed from high-grade leather to cushion firing tension and enhance durability. They are often quite expensive and not easy to find. In addition, integrated loop slings are difficult to adjust and limit the number of shooting positions. 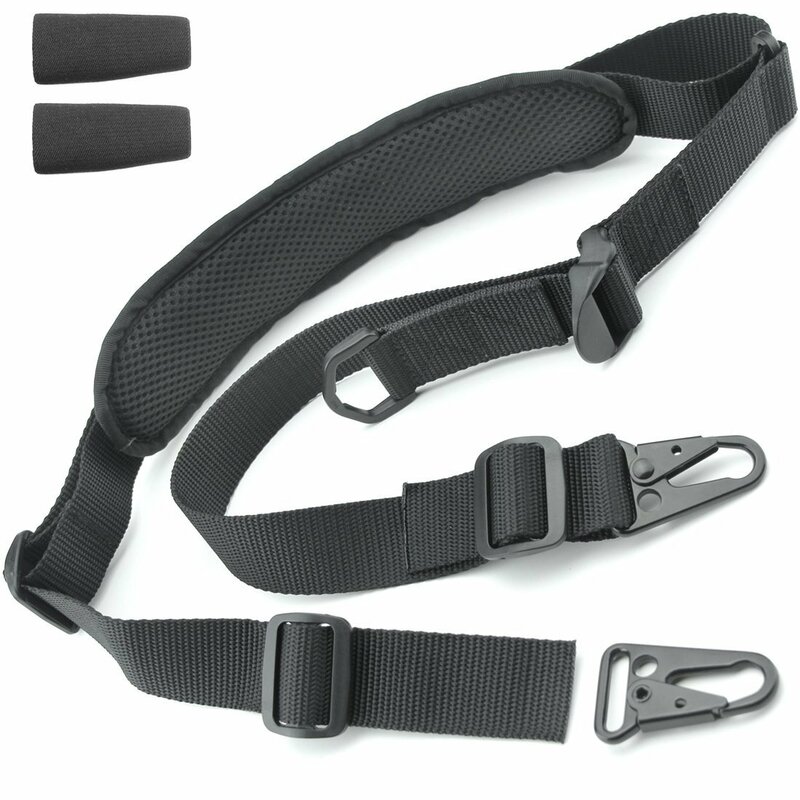 These slings are designed to offer stability at the front end of the rifle. They not only provide stability while shooting, but they also help the gun owner raise the shotgun to a quick firing position. There are three types of patrol slings: single point, two point, and three point slings. The single point patrol slings allow you to swing the shotgun to any shooting position. However, they sacrifice on weapon retention and shooting support. The single point is detached from the fore-end and wrapped around the gun body. The tension created is vital for redistributing the shotgun weight. This helps to make the front-end feel lighter and better position your aim. A two-point patrol sling provides certain advantages over the single point sling and is used in a number of special operations. This type of sling mounts on the side of the shotgun instead of the underside, which allows you to swing the rifle across your chest or back. This diagonal resting position is comfortable and provides ample gun retention. The sling has a quick adjust mechanism that adds to the offhand firing support. The three-point patrol sling is rarely used because of its many shortcomings. It is bulky, difficult to adjust, offers clumsy support when carrying the rifle, and frequently gets in the way of firing action. It attaches to the front and rear end of the shotgun and has an additional loop for stability. However, this construction acts more as disadvantage than a merit. Moreover, it interferes with shooting operation, especially for a left-hand user. This sling has two buckles that quickly attach or detach onto your shotgun. This is an advantage in tactical operation when you need the sling out of the way for better shooting. Being a two-point sling, it provides great support for your rifle while moving or when in a shooting position. The strap is made from 1.25-inch tough nylon that can support even the heaviest of assault rifles. The inbuilt transition lock allows quick adjustments of the strap to position the gun for a better aim or swing it onto your shoulders when moving fast. The nylon construction has excellent tension support and remains intact even in the heaviest recoil from a shotgun. Condor speedy 2-point shotgun sling is ideal for the rifle owner on a budget. It designed for the heaviest shotgun models in the market. 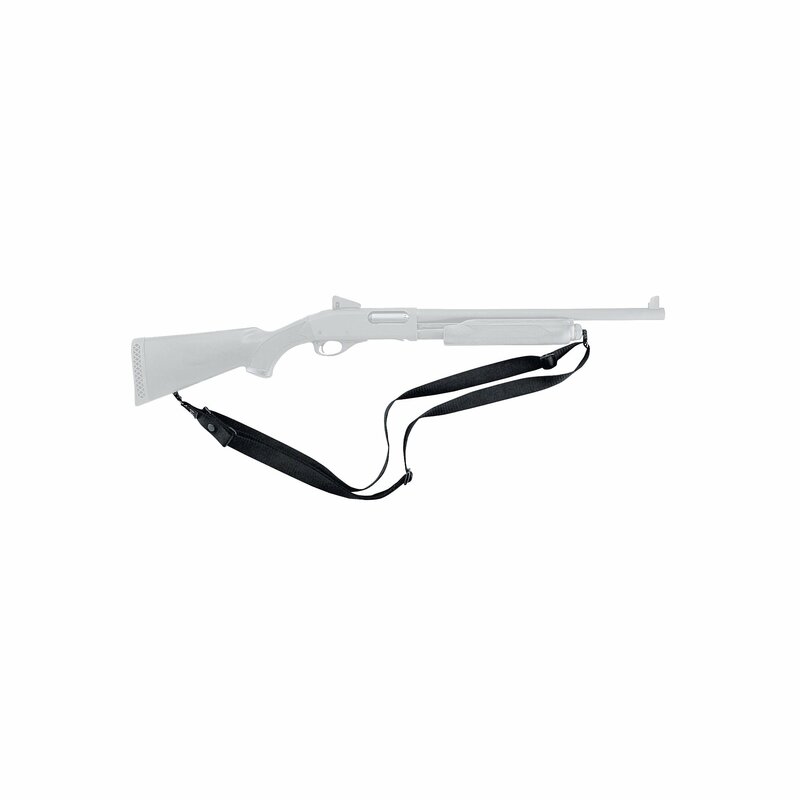 The sling strap is padded to provide shoulder comfort while carrying the rifle around. The condor speedy sling is compatible with most shotgun rifles; you should be able to switch rifles using the condor speedy sling with minimal hitches. This sling is perfect for a home-defense shotgun. It is constructed from tough nylon webbing that distributes weight on the rifle when in firing mode. The strap has elastic pockets to hold extra 12-gauge shotgun shells. This sling admittedly will make your shotgun heavy, which is why it is not meant for the tactical shooter. It is ideal for the homeowner who needs a few extra rounds to contain an intrusion. The ends of the strap have solid spring hooks made of steel and easily fasten to the rifle sling mounts. The Blackhawk tact shotgun sling can easily mount to most shotgun models with in-built mounts. In case your rifle does not have mounts, you can purchase cheap adapters to attach the sling. You can also adjust the strap to your rifle’s or body length. 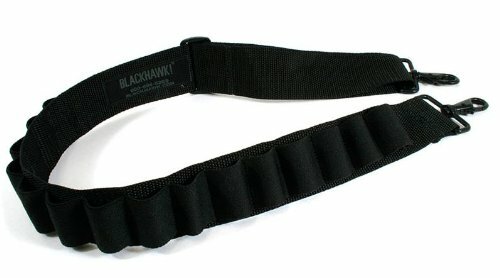 The Blackhawk tactical sling offers great aim for the stationary shooter protecting his home. The strap also offers quick ammo access in case you run out. This shotgun sling suits heavy shotguns like the 12-gauge. It is designed with adequate padding to enhance comfort while carrying your gun around. The strap is adjustable to vary aiming position and promotes mobility from one shooting position to another. While slung, the shotgun strap can be easily swapped from shoulder to shoulder. Uncle Mike shotgun sling is 1-inch wide on the ends and 2-inches in the middle. This not only makes it comfortable but also strong. The sling is adjustable at the front end and has close cell foam on the rear for added comfort. The Uncle Mike shotgun sling should be able to fit in traditional shotguns. It can work on both a semi-automatic and pump action rifle. In-built swivels allow the sling to attach easily to any shotgun mount. Additionally, the swivel mechanism allows you to switch from carrying to shooting mode with ease. The uncle mike shotgun sling is recommended for the shotgun used in police combat action or home protection. I honestly gave my verdict way too early and it was in support of the Blackhawk tactical shotgun sling. It may not be the lightest shotgun straps in the market, but I like its stability and versatility in reinforcing a home-owned shotgun. Since the shotgun will feel heavier, the nylon webbing does a great job in redistributing this weight so you will not feel it. The strap is easily adjustable and is padded to protect the shoulder while carrying a shotgun.